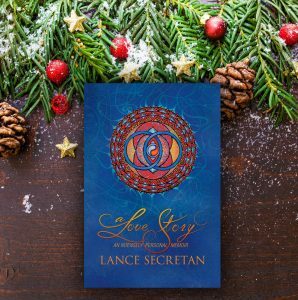 Holiday Stocking Stuffer Idea | The Secretan Center, Inc.
A Love Story: An Intensely Personal Memoir, is the story of my soulmate Tricia’s and my remarkable 30-year journey together, using poetry I had written privately to her over the years, woven through the narrative. I write about leadership, so this a big departure for me. To my complete amazement, it won many awards for design and writing, and even a poetry award (I never considered myself to be a poet!). Many couples tell me they read a chapter to each other each night before turning the lights out. Treat the special person in your life with this gift! Click here for a 50% discount—use the code “LOVESTORY”. You Lance are truly amazing! We have had the most precious experience through our association with you and your outstanding positive attitude ! We both admire and love you! Wow! How kind of you to say this Jamie and Stephanie! I am honored! I wish you both, and your families and four-legged members, a wonderful Christmas and a blessed New Year!